Group photo in front of the lesser pandas. 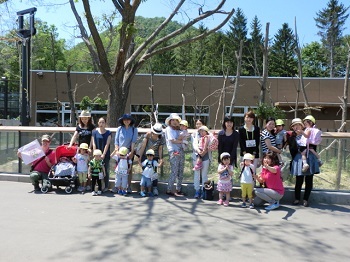 Today the Koala class went to Maruyama Zoo! We could see many animals there and had a sticker rally. 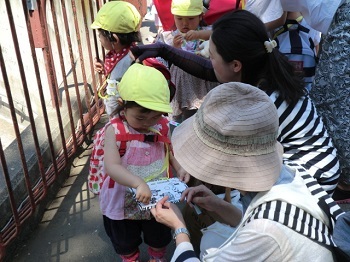 When we saw an animal like a monkey we practiced saying, “I see a monkey,” and got a sticker. We saw big hippos, tall giraffes, cute lesser pandas and more! We took group photos at the zoo and had snack time in the shade under a tree. 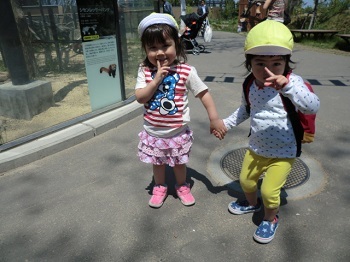 It was a sunny day so it was hot but we could enjoy seeing many animals. It was fun!